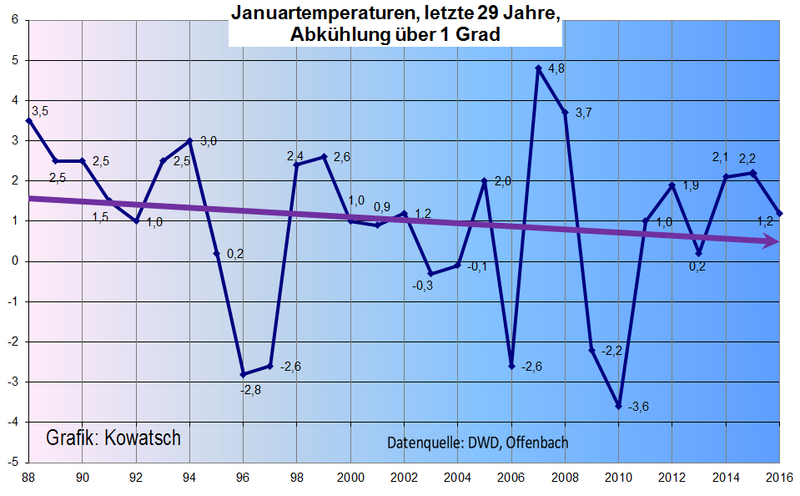 Germany’s DWD national weather service has released the preliminary mean temperature for the country for January, 2016. The data show the month was 1.2°C above the long-term mean. So far the European winter has been a mild one – thanks to a persistent mild weather pattern that has brought warm and moist Atlantic air over the continent most of the time since early November. That pattern led to December 2015 setting an all-time record for the month for Germany. In January the westerly pattern go interrupted twice by polar air. The chart shows the temperature anomaly from the long-term mean since 1988. And despite the current massive El Nino, meteorologist Joe Bastardi shows at his weekly Saturday Summary that globally January temperatures failed to set a new record, according to what Joe calls the gold standard for measuring global temperature, NCEP. The month so far is coming in at 0.556°C above the mean. 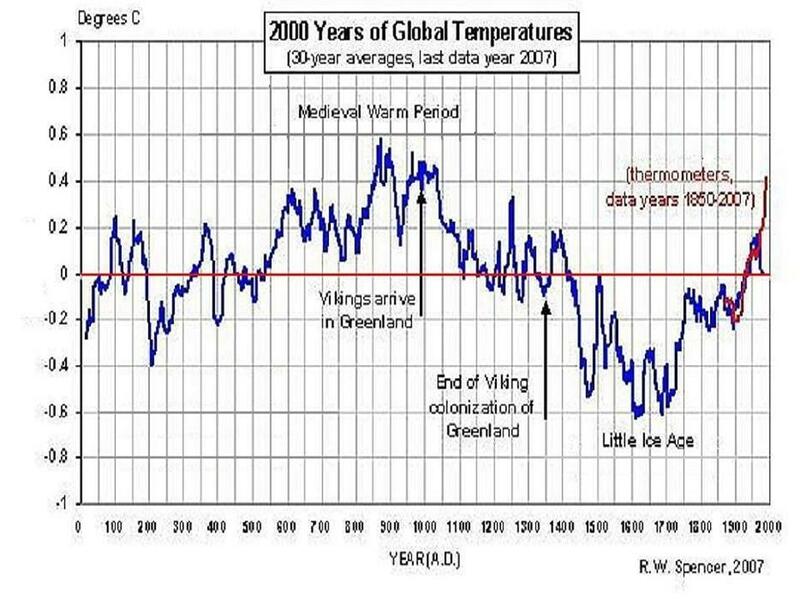 What’s more, Tony Heller at Real Science here shows us that NASA has been busy rewriting history by adjusting past temperatures data. Back in the 1970s, NASA data were showing a rapid cooling since the 1940s. Over the past years NASA has been busily rewriting the data, and consequently the mid 20th century cooling has disappeared, á la George Orwell. Fell just short at .553, statistical tie. Oct-Jan is now the warmest period on NCEP record for that 4 month stretch! Thanks, Joe, for this update. Readers note that we’re talking about mere hundredths of a degree – hardly the sort of thing to panic over. And in what is meant to be a big El Nino. UAH global in at +0.54, mostly from tropics and NH. But why is this El Nino so much warmer than 1997-98, and 1982-93, when tropical Pacific Ocean temperatures are about the same? Why? To give people like yourself something to fret over, invent catastrophes around, and then pretend you know the solutions to, at massive unnecessary expense to everyone else. Whenever I hear your presentations, I think of this meteorologist. Like yourself, he was also a genuine human being who’s passion for his work made watching a weather forecast by him often more satisfying than any “entertainment” program. That’s probably why over 40 years later, I haven’t forgotten him. And I’m not alone. So, the situation is thus: “Overall the DWD remains silent on the overall trend.” One wants to know when these “yahoos” are going to get their heads out of the hinterlands (i.e., “sand”) and wake up and smell the roses? Cooling over January if you cherrypick the timespan, country and month? That is one hell of a thing to keep silent about! Most institutions in Germany (government, old parties, media, police, warmunist scientists) have resorted to spreading lies in Germany. This seems to accelerate as you must invent 7 lies to cover one old lie. Looks to me like a ratchet effect heading for a full scale systemic collapse: akin to the collapse of the USSR. Only after that will come a renaissance. DWD is as incapable of reform as all the other tainted institutions. At this time, none of them can even hire an honest man as he would be too dangerous. Deutscher Wetterdienst cherrypicking Deutschland of all countries? Inconceivable! Comparing the temperatures of the coldest winter month when AGW should have made winters gradually milder? Preposterous! The temperature trend of the last 3 decades when anthropogenic CO2 should have created measurable warming? Anti-Science! The report here is cherrypicking news that show a cooling trend. If it was not Germany, it could be ireland or Iceland. 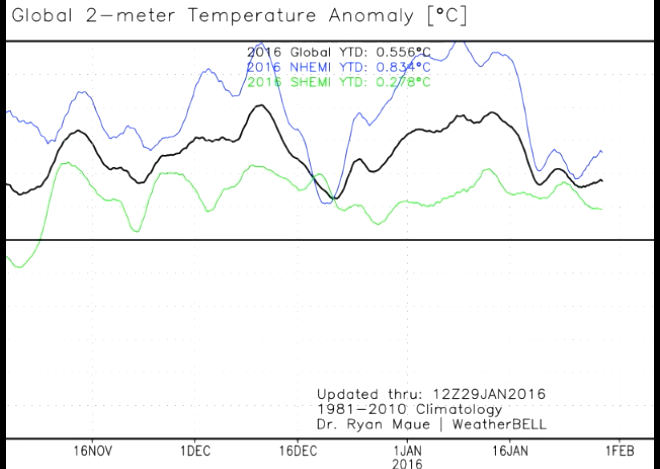 If January was not showing cooling, the report here would have been about December or February. It is not 3 decades. it 88 to 2016. a cherrypick, like the 16 years used in the last posts, which by chance still had a warming trend in January. Stick to wind energy? That is so reactionary of you to ask just as Pierre cherrypicked wind energy, Germany, February and Fraunhofer for his post on the massive maintenance costs*) of offshore wind turbines. We will never achieve peace and social justice if sod follows your advice! Onward! If Party apparatchiks showed your dedication and fervor in defending the system, the Soviet Union could have survived at least a month longer. Yeah, that’s so much worse than warmists calling the average ice extent for 21 years (1979-2000) a “CLIMATE mean,” …which is especially egregious since they did have satellite data from before 1979 which shows that today’s ice extent is not abnormal. Because in a mass of data with a range of from -2 to +2, warmists can douse out a “trend” on the order of 10ths of a degree? Riiiiiight! Bottom line, sod, I have to agree with you. When it comes to cherry pickers, compared to them we’re just pikers. So, no hard feelings. Have a cherry, sod.…because when all is said and done, a cherry is a cherry is a cherry. Just don’t pretend the one you pick is significantly different, or any better, than anyone else’s. It’s not. “History of sea ice in the Arctic,” Leonid Polyak et al, Quaternary Science Reviews 29 (2010) 1757–1778. Thank you for that very scholarly appearing alarmist’s irresponsible opposing view, which unfortunately seems not to reflect actual history. See also here for a general but thorough discussion. While we’re at it, here’s one on the “runaway” temperatures that are causing your paper’s authors’ brains to melt. Yonason — your link points to studies of specific sites, NOT to a global number. We aren’t discussing a “global number,” David. We are talking about ARCTIC ice. Stay focused. Europe is ripe for an adjustment, American style. UAH Data for January is up and it is hot. But Spencer made some serious changes to the data, so i currently can not even figure out if it is the hottest or not. Meanwhile, UAH just posted their January anomaly for the lower troposphere — it was the warmest January in their records. As were Oct15, Nov15 and Dec15. Did you notice that today Roy Spencer admitted to adjusting the UAH model _BY HAND_? David Appell droppings at Roy Spencer’s blog. Yeah, riiiiiiight. But you’re OK with these totally unmerited adjustments. Try and keep up Apple, the satellite data is now ignored by alarmist because it underplays the warming, oh wait……..